There are a number of key matchups this week among our top 25 teams. #6 Stanford travels to #3 Vanderbilt for a true benchmark series for these two Omaha hopefuls. Of course, one could argue that Stanford just came out on top of a benchmark series last weekend when they took 2 of 3 on the road against Rice. #4 TCU hosts #12 Cal State Fullerton and but we won’t get a Noe Ramirez v. Matt Purke matchup as Purke was pushed to Sunday due to blisters. #21 California and #22 Coastal Carolina will also face each other once this weekend at the Caravelle Resort Baseball at the Beach event in Myrtle Beach, SC. Mike Appel – RHP – Stanford – So. 6IP 7H 2ER 3BB 3K. (L, 0-1). Tough luck loss @ Vanderbilt. Tyler Anderson – LHP – Oregon – Jr. 7.1IP 3H 2ER 3BB 12K. (W, 1-0). Sam Gaviglio – RHP – Oregon State – Jr. 9IP 2H 0ER 1BB 10K. (W, 1-0). Kevin Miller – RHP – California – Sr. 7.1IP 1H 0ER 1BB 10K. (W, 1-0). Not sure if Miller is a legit draft prospect but outings like this against ranked teams (#22 Coastal Carolina) can make people like me take notice. Jake Barrett – RHP – Arizona St. – So. 4IP 8H 4ER 2BB 5K. Sonny Gray – RHP – Vanderbilt – Jr. 6IP 3H 1ER 4BB 6K. (W, 2-0). The Gray/Apple matchup lived up to the hype in a 2-1 Vanderbilt victory. Michael Roth – RHP – South Carolina – Jr. 6.2IP 4H 1ER 2BB 9K. (W, 2-0). 15-3 K:BB ratio through 2 starts. Steven Gruver – RHP – Tennessee – Jr. – 7IP 2H 0ER 0BB 10K. (W, 2-0). I didn’t know much about Gruber before the season but through 13IP he’s given up 0 runs and struck out 18. Hudson Randall – RHP – Florida – So. 5IP 4H 1ER 0BB 4K. Kevin Gausman – RHP – LSU – Fr. 6IP 4H 3ER 3BB 7K. (W, 1-0) Get used to seeing Gausman start a lot of Friday games for LSU. Although he will be a draft eligible sophomore in 2012. Ryne Stanek – RHP – Arkansas – Fr. 5.2IP 3H 2ER 1BB 2K. Interesting that they started the blue chip freshman and brought Baxendale (last week’s Friday starter) out of the pen. DJ Baxendale – RHP – Arkansas – So. 5IP 4H 0ER 1BB 7K (W, 2-0). Taylor Jungmann – RHP – Texas – Jr. 9IP 4H 0ER 0BB 9K. (W, 2-0). John Stilson – RHP – Texas A&M – Jr. 9IP 4H 0ER 0BB 9K. Solidifying his 1st round status after move to the rotation. Logan Verrett – RHP – Baylor – Jr. 6IP 5H 2ER 2BB 6K. (W, 1-1). Much stronger than last week in win over Georgia. Matt Stites – RHP – Missouri – Jr. 5.2IP 7H 3ER 3BB 3K. Tom Lemke – RHP – Nebraska – So. 4IP 8H 5ER 1BB 5K. Rough outing for the 6’8″ beast. Danny Hultzen – LHP – Virginia – Jr. 7IP 3H 1ER 0BB 15K. (W, 2-0). Pitching performance of the day! Sean Gilmartin – LHP – Florida St. – Jr. 6IP 6H 2ER 0BB 5K. (W, 2-0). Mark Pope – RHP – Georgia Tech – Jr. 6IP 6H 0BB 0ER 1BB 7K. (W, 2-0). Convincing 13-0 win over St. John’s. Chris Munnelly – RHP – UNC – So. 5.2IP 8H 5ER 1BB 7K. (W, 1-0). UNC now 5-0. Scott Weismann – RHP – Clemson – Jr. 5IP 3H 2ER 1BB 4K. (W, 2-0). Elliot Glynn – LHP – Connecticut – Sr. 7.1IP 3H 2ER 3BB 2K. (L, 0-2). UConn falls to 1-3. Brian Dupra – RHP – Notre Dame – Jr. 6IP 4H 0ER 1BB 11K. (W, 1-0). Randy Fontanez – RHP – USF – Sr. 7IP 6H 0ER 0BB 3K. Kyle Winkler – RHP – TCU – Jr. 7.1IP 6H 0ER 1BB 2K. (W, 2-0). TCU didn’t need Purke to beat Noe Ramirez and Cal State Fullerton. Matthew Reckling – RHP – Rice – Jr. 4IP 4H 2ER 5BB 7K. Anthony Meo – RHP – Coastal Carolina – Jr. 5IP 10H 9ER 1BB 6K. (L, 0-1). Rough outing for the potential 1st round pick against a tough California team. Adam Lopez – RHP – VMI – Jr. 6IP 5H 2ER 1BB 9K. (W, 1-1). Cody Allen – RHP – High Point – Jr. 7IP 3H 0ER 1BB 10K. (W, 1-1). Noe Ramirez – RHP – Cal State Fullerton – Jr. 6IP 5H 2ER 2BB 8K. (L, 1-1). Andrew Gagnon – RHP – Long Beach State – Jr. 7.2IP 4H 0ER 0BB 7K. (W, 1-1). Phillip Ferragamo – RHP – UC Irvine – Fr. 1IP 0H 0ER 0BB 2K. Dylan Covey – RHP – San Diego – Fr. 7IP 5H 2ER 4BB 4K. (W, 1-0). Is the move to the Friday starter role permanent? Could be this year’s Matt Purke. Covey, Stanek, and Gausman all members of my Preseason Freshmen All American Team. 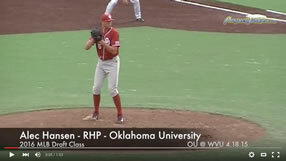 Chris Jensen – RHP – San Diego – Jr. 2IP 0H 0ER 1BB 3K. (S, 1). Started last Friday against Vanderbilt. Ryan Carpenter – LHP – Gonzaga – Jr. 7.1IP 1H 0ER 3BB 10K. Pitching duel between potential 1st round picks (Carpenter and Texas A&M ace John Stilson) lived up to hype in 1-0 Aggie win. Charlie Lowell – LHP – Wichita State – Jr. 5IP 0H 0ER 1BB 9K. (W, 2-0). Let him try for the no-no! He was at 60 pitches. David Peterson – RHP – College of Charleston – Jr. 6IP 1H 0ER 2BB 3K. (W, 1-0). Chris Beck – RHP – Georgia Southern – So. 8IP 4H 0ER 0BB 12K. (W, 1-0).